The last soundtrack of composer Guy Farley's that I reviewed was Cashback. While I enjoyed Farley's music on that release, it was spoilt somewhat by the inclusion of a number of rather poor 'pop' tracks. 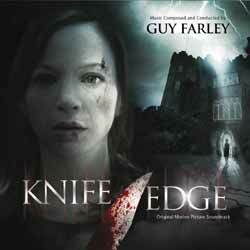 Thankfully, with the release of Knife Edge, we get approximately 40 minutes of Farley's music. The first few notes of the opening theme instantly reminded me of John Williams 'A New Beginning' from Minority Report. But this very quickly transforms into a Bernard Herrmann-esque theme. 'England', which has one of the albums most beautiful themes at its core. 'The House' has a number of interesting segments, one of which reminded me of Nathan McCree's score for the first Tomb Raider game. 'Collapsed' - is noteworthy only because it appears to pay homage to James Horner's Aliens theme. 'A Kiss' is very reminiscent of John Barry's work. It also revisits the theme used in 'England'. 'Emma & Pollock' is one of the most powerful and emotive tracks, collecting a few interesting themes. Shame it wasn't a little longer. 'It's Turning' is another powerful and hauntingly beautiful collection of themes which bounce off each other perfectly. 'Old Photos' is quite haunting and, again, reminiscent of McCree's Tomb Raider music. 'Roof Chase' is another Herrmann-esque track. In fact this one is much more obvious - with just a hint of the music from Vertigo. To be honest every track on this score has something positive to recommend it - I had to stop myself writing a dull track-by-track review. All you need to know is that from start to finish the music for Knife Edge will excite, thrill and move you.